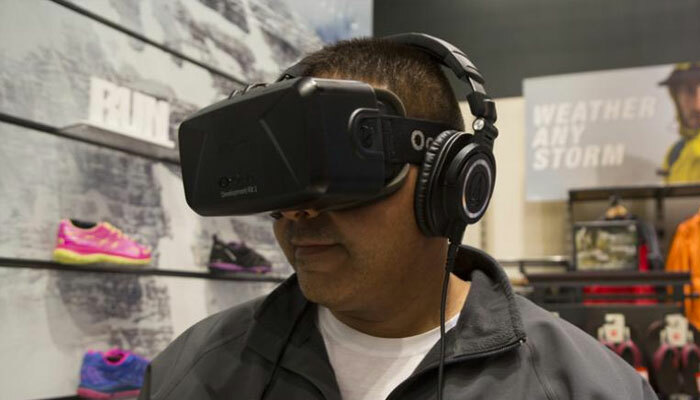 VR is the newest tech to hit the advertising and marketing world. Being at the forefront of the latest wave of new technology is often confusing for marketers. There is very little documentation or examples explaining the strategy or methodology for the campaign. Brandweek Magazine named me “Marketer of the Next Generation” for my work, connecting brands with their audiences through interactive engagement. I’ve spent my entire career creating the never been done before digital experiences for some great brands. Everyone is looking for a guide, something to help them better understand the strategy, methodology and success criteria for anything new. In this post, I hope to shed light on the brands that are capitalizing on this new technology and provide my insights to the campaigns. This list will continue to be updated as new VR initiatives are launched. First of all, what is the VR experience? These campaigns usually come in the form of media content that falls into two categories. CGI Real-Time Game Engine Render – Content is rendered at real-time using a 3d game engine, usually Unity or the Unreal Engine 4, providing the truest VR experience. This allows for dynamic and interactive content. 360º Video or Static Photography – Content is pre-rendered and comes in the form of an MP4, displayed in an orbital format. So instead of the video being displayed in a container, it is displayed on a sphere, around your viewing area. So you can see the video in all directions.This video is playable via mobile devices as well as through the web, making it highly portable. Mixed Media – Some VR experiences do use a blend of 360º Video and CGI Real-Time Game Engine Render. At the 2014 San Diego Comic-Con, 20th Century Fox released an activation to support the home release of the movie – X-Men: Days of Future Past. In the experience participants assumed the role of Charles Xavier, the X-Men’s telepathic leader, and scanned the world looking for mutants. It was a linear narrative experience, however the one interaction was he ability to control Xavier’s wheelchair via a game control stick. The activation was 3 minutes long and only took place at this one location. It was never released publicly. Released at the 2015 CES Conference, 20th Century Fox allowed participants to walk along with Reese Witherspoon and Laura Dern in a 360º narrative experience to promote the film The Wild. The experience was never released publicly. Sports fans at the 2015 U.S. Open received a special treat thanks to American Express. 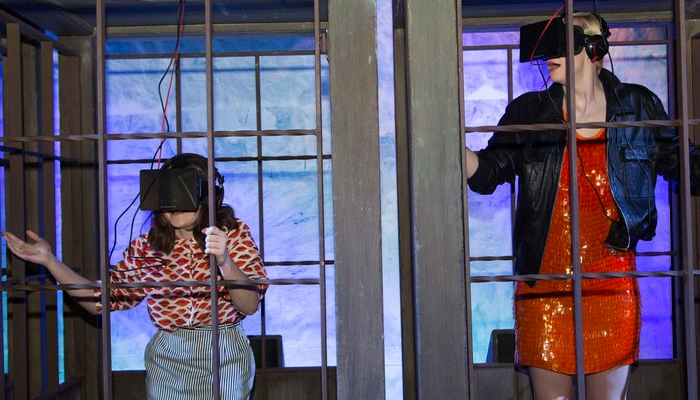 American Express’ VR experience gave tennis enthusiasts a chance to play opposite Maria Sharapova. 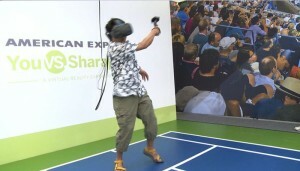 It is the first branded activation to utilize the HTCVive headset and controllers, that allowed you to swing a racket and try to return Sharapova’s serve. 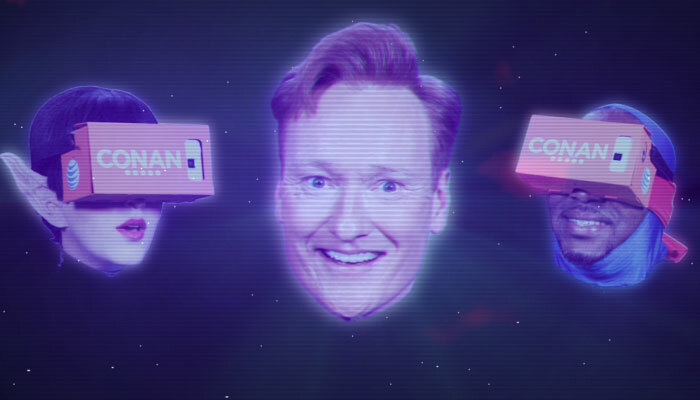 In 2014, AT&T sponsored 360º views of the Conan on TBS. The original showcase featured a special week long show while Conan was in Dallas Texas Dallas for special shows leading-up to Turner’s broadcasts of the NCAA Final Four games. Later, they released content from Conan’s broadcast at Comic-Con San Diego. One of the VR features showed Conan letting four and a half pounds of Texas red meat loose via a catapult. Originally released as a web series, the team later released a mobile App. 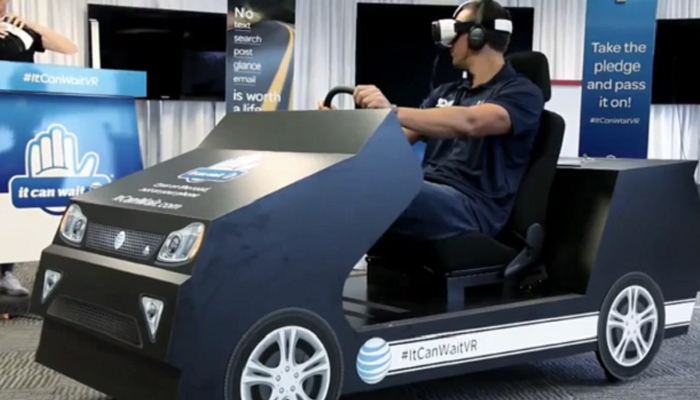 The anti-texting campaign “It CanWait” was revamped in 2015 to include a VR downloadable app and a traveling VR experience. The mobile experience came via an iPhone or Android app. The VR simulator took place over a 100-city tour across the United State visiting schools, fairs and partner companies. Users get a first hand simulation of being in a car and the potentially deadly consequences of glancing at your phone while driving. You may have to wait to see this in person as it is only available at certain European Audi dealerships. The Audi VR experience gives customers the opportunity to configure their car at the dealership, while in VR. The headset showcases the entire model portfolio with every possible equipment combinations. The Audi VR experience is also equipped with high-end headphones by Bang & Olufsen. The experience utilizes a game engine to live-render the vehicle, materials and customer configurations on the fly. Originally launched with the DK2, sources tell me that the new wider release will utilize the Oculus Rift. The TT Experience allows you yo view 360º video content of being in the passenger seat of the Audi TTS in a test drive around the Neuberg Audi closed race track in Germany. 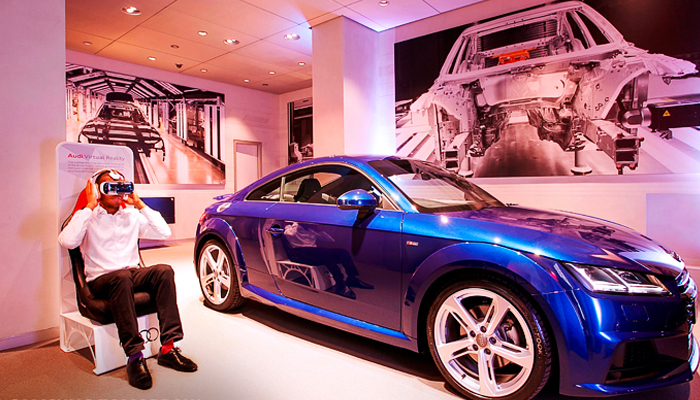 The experience ran for 1 week in over 100 Audi dealerships. French fashion icon Christian Dior has released “Dior Eyes” at select stores. This 360º experience showcases models as they scurry around in shiny silk robes and get made up for the runway. No, this isn’t a spoof. 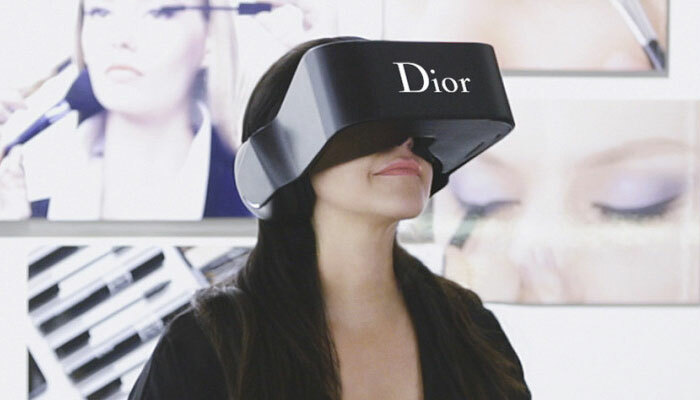 The Virtual Reality Gold Rush – Dior Eyes Making-of from Don Anderson on Vimeo. 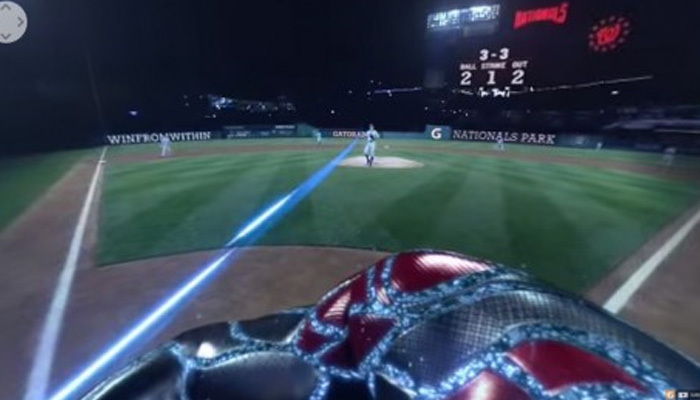 A combination of live action video and computer generated visuals give users a simulated experience of what Bryce Harper sees when he is at bat. The experience is 3.5 minutes long and is available on YouTube. The original experience launched at Comic-Con in 2014 and has gone on to become a traveling marketing event for HBO. Participants travel up the base of the Wall, the 700-foot structure in the land of Westeros in Game of Thrones. Fans provide a cold wind and the cage jerks as you move up to the top of the Wall. A real fan favorite, but is starting to show its age. Take a test drive in a modified game engine that has been surrounded by the Lexus RC F interior. Originally launched at the Pebble Beach tournament in 2014, the experience made appareances at a few other auto conventions. 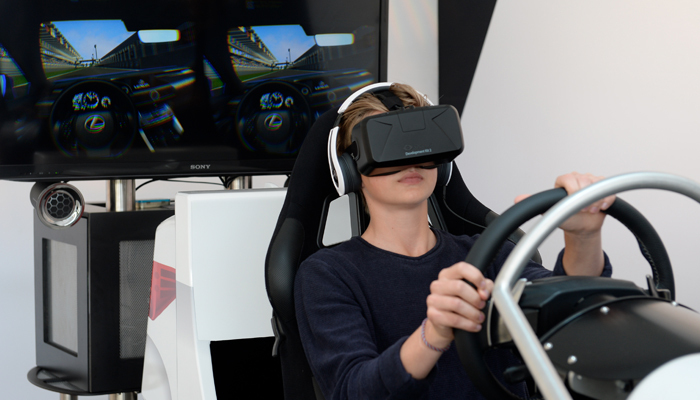 The VR simulator includes genuine RC F steering wheel and foot pedals for users in the simulator to control. 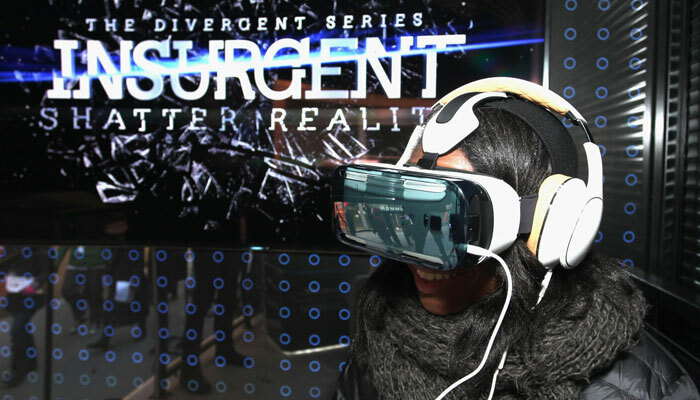 Shatter Reality” as a four-minute virtual reality experience to promote the 2015 Lionsgate’s movie – The Divergent Series: Insurgent. The experience originally launched via a roadshow tour in New York, Chicago, Los Angeles, Austin and San Francisco. The experience was then released via Oculus Share and then as a mobile App for use with Google Cardboard. This pop-up event took place in and around Marriott hotels across the US over an 8 week period. The experience begins with a CGI version of the lobby bar of the Marriott Baltimore Waterfront. You move to a map of Hawaii and then are transported to a 360º video experience of the Wai’anapanapa Black Sand Beach in Maui. Then you can look from the top of the Tower 42 in London. Within the physical pod stations, heat lamps and misters provide a 4D effect which helps sell the experience. 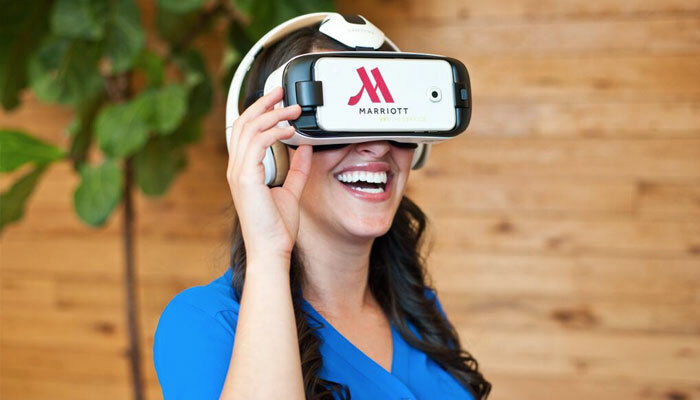 Visitors at Marriott Hotels the New York Marriott Marquis and the London Marriott Park Lane can now have VR headsets delivered via room service. The program, called VRoom Service allows guests to order a Samsung Gear VR headset brought up to their room for 24 hours. 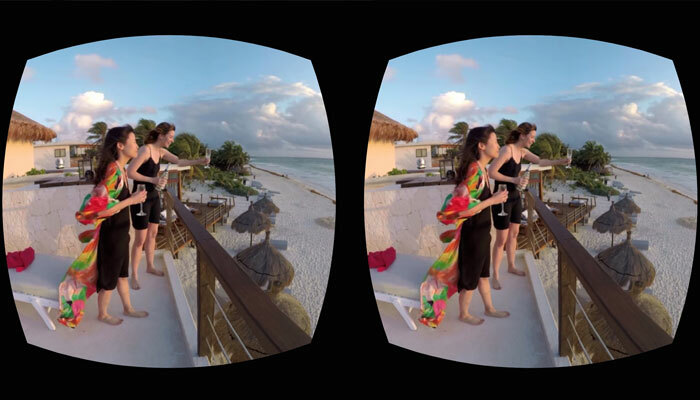 The devices come pre-loaded with three videos that Marriott is calling “VR postcards.” Each of the three videos shows a different traveler on a trip, narrating their feelings to an unseen camera. The three travelers include a woman in Chile, a woman in Rwanda, and a man in Beijing. The experience helps illustrate how travelling has changed these people’s lives. 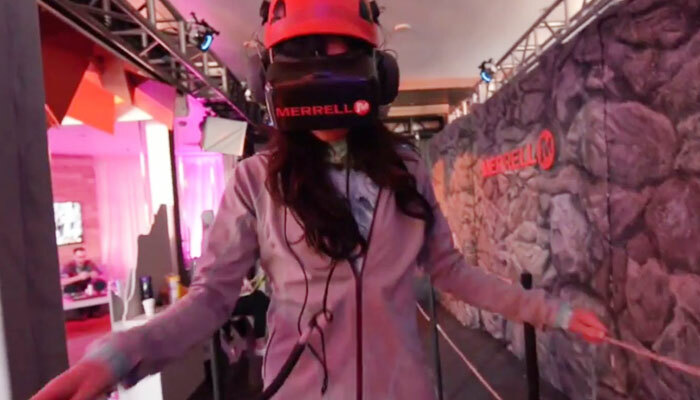 Hiking boot brand Merrell and Rolling Stone Magazine released a VR activation at the 2015 Sundance festival. The experience allowed participants to walk along a crumbling ledge and over a treacherous wooden bridge high in the mountains. The promotion was for Merrell’s most technical hiking boot to date, the Capra. The activation was geared to attract a younger audience to the Merrell brand. MTN Dew has been an early adopter of 360º VR Videos. It began with a skateboarder series available via the Oculus DK2 that was available at special Dew Tour events. Then a snowboarder series was created exclusively available on the Samsung Gear Milk VR player. It has now has grown into an episodic series available on YouTube. 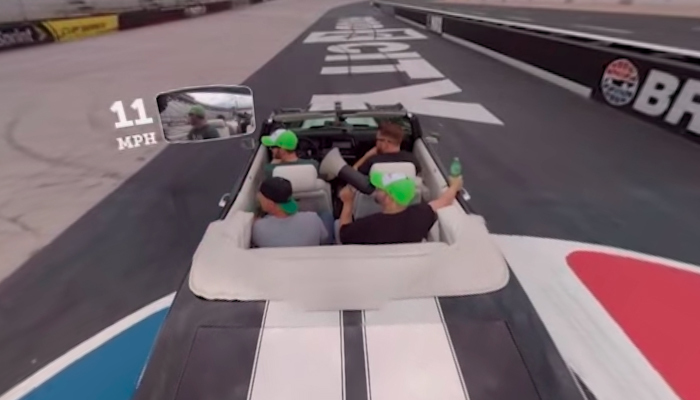 The latest is a race street race through Bristol, Tennessee, with Dale Earnhardt Jr. as your driver. You’ll be going over 100mph through town and around the track at the iconic Bristol Motor Speedway. The North Face created this in-store experience designed to boost customers’ connection to the outdoors. The launched in select North Face locations in Chicago and in Manhattan. Participants experienced 360º videos of Yosemite National Park and Moab, Utah, alongside North Face global athletes Cedar Wright and Sam Elias. 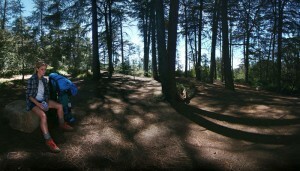 The experience was later released nationwide as a mobile app for use with Google Cardboard. 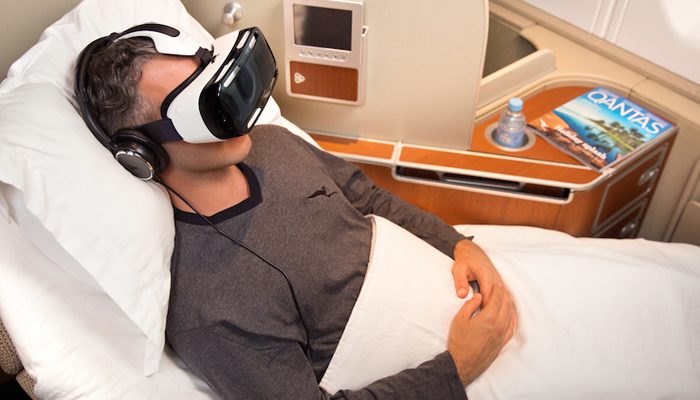 The campaign was a 3 month trial put together by Qantas and Samsung Electronics Australia as a trial entertainment service that uses Samsung Gear VR technology to give customers a 360º video view of Qantas content – view of an A380 landing from the tarmac or a view of the new LAX First Class Lounge. The headsets were made available to customers in Sydney and Melbourne International First Lounges as well as in the First Class cabin. Refinery 29, a lifestyle publication has released a series of VR videos showcasing a group of fashionable friends and their adventures together. The series lets viewers explore street fashion, boutiques, landmarks, and restaurants as if you’re walking around in the cities with a group of girls. The experiences take place in cities like Tulum, New Orleans, and Berlin. The series are geared towards tech-savvy females. Available on Samsung’s Milk VR. 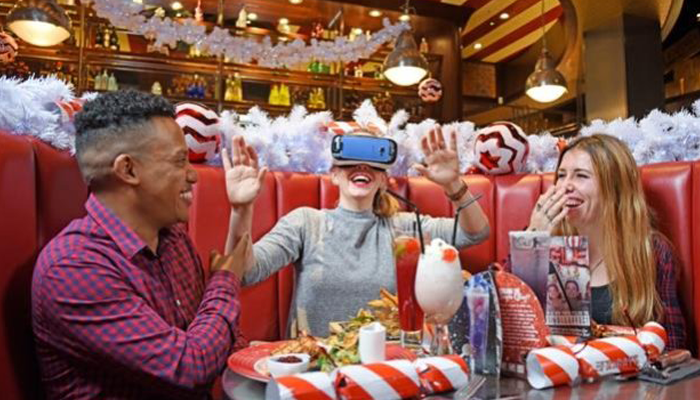 TGI Fridays released the 360-degree virtual reality (VR) experience in a number their restaurants this Christmas, as part of the brand’s #JingleEffect campaign. Participants get the opportunity to take a sled ride through a snow-capped landscape while enjoying their favorite libations. 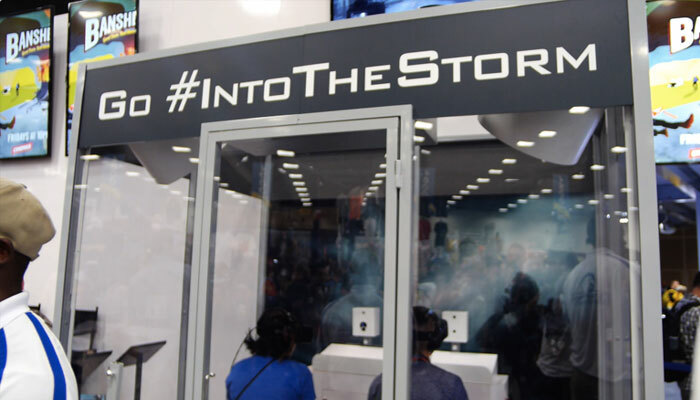 Warner Bros. released this two seater VR experience at the San Diego Comic-Con in 2014, marketing the film Into the Storm. The visual experience showcased a recreation of a scene in the movie, where the hero takes refuge in a storm drain as a tornado passes over. The experience included haptic feedback via a wind machine and rumble seats within the enclosed viewing room. Want to get in touch? Contact us anytime.